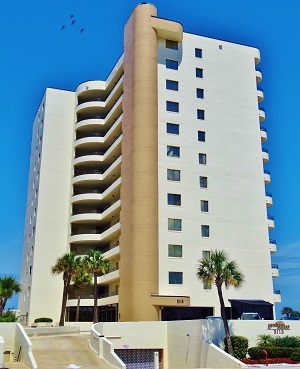 The prestigious Sand Dollar Condo is one of the few Daytona Beach Shores condos that allows weekly rentals! Located Just north of the Dunlawton Bridge on the drive beach and close to shops, restaurants, entertainment and more. Great for a second home, vacation getaway, or an investor looking to capitalize on weekly rental income. 2 bedroom floor plans are available. The location and desirable amenities make Sand Dollar a great option for buyers looking for an oceanfront condo. Sorry no pets allowed. This 12 story, 57 unit complex does not allow pets and has a weekly rental policy.